"You will give the people an ideal to strive towards." For many, this is the Superman film you've been waiting for, ever since you believed a man could fly in 1978. Director Zack Snyder (300, Watchmen) and the creative team behind The Dark Knight trilogy, producer Christopher Nolan and writer David S. Goyer, have successfully reimagined and retold the story of the last son of Krypton for contemporary audiences with a grittier, more grounded feel. Man of Steel is mostly everything fans want from the superhero and possibly not much else. Henry Cavill dons the red and blue tights for an action packed, mediative superhero epic, fully embracing the science fiction genre and its style of visual storytelling. This more complex interpretation of Kal-El's origins is mostly told through flashbacks with inventive twists on the familiar tale we all know. Snyder is successful in his focused, economical storytelling of how Clark becomes Superman with most of the moving parts of the film fitting fairly nicely together, culminating in a dramatic space opera. Man of Steel is primarily focused on the idea of Superman's struggling identity of who he is, his decision to give up on his home world, accepting his adopted home of Earth, and being accepted by its people. Clark's struggle is a classic tale of two fathers caught between different worlds. Jor-El (Russell Crowe) sees great things for his only son and sends him to be a saviour and god on Earth. However, Pa Kent (Kevin Costner) wants him to hide his powers, integrate, assimilate, and become more human. Costner and Crowe serve as great contrasts in fatherhood with diverging roles in the development of Superman. Cavill gives a very confident, assured performance. Unfortunately, Clark Kent, Kal-El, and Superman are all ultra serious and humourless throughout, even as a child. Cavill shows his natural screen presence with a Shakespearean feel but is hampered by the breakneck pace of the film. Despite his earnestness, Cavill's more troubled and complex performance is an intriguing and interesting take on the man of tomorrow before he assumes his famous mild-mannered reporter identity. The way the film integrates Amy Adam's Lois Lane into the story is refreshing in how her character moves the plot forward. We see Lois help create and discover the myth of Superman on her search for the secret hero. Michael Shannon walks leisurely through scenes with his ease and gravitas, owning the role of the menacing General Zod. He's hell bent on destruction and builds up his motivations well. Zod is the good guy in his own story as he is literally engineered to be a Kryptonian warrior and protect his people at all costs. However, it's his commanding officer and chief hench-woman, played by Antje Traue, who absolutely steals the film. She is terrifyingly compelling and deliciously watchable in her villainy and physicality. Despite its entertainment, the film isn't for everyone. Superman here is very different, even though it hits most of the familiar hallmarks. For one, the film is extremely violent and can feel cold with a grim tone. The sheer amount of destruction and carnage the Zod and his Kryptonian army unleash is massive. It makes the 9/11 imagery from The Avengers look like child's play. While at points breathtaking and awe inspiring, the action scenes can lack a proper context as Snyder makes a stylistic decision to photograph the action at ground level with a lot of jarring close-ups. Snyder and cinematographer Amir Mokri put the audience right into the action, employing a hand held, point-of-view camera. Screenwriter Goyer is able to make sense of the complicated and convoluted Kryptonian mythology. However, as the plot really unfolds, characters on screen very clunkily say exactly what is happening with some remarkable cases of instaneous knowlege in order to move the plot along very quickly. The film rises of above this sometimes clunky storytelling and wooden dialogue, juggling Superman's battles with Zod, the Daily Planet, American military presence, Smallville, and Lois and Clark's journey, all simultaneously. These elements ultimately make for a compelling, thrilling experience in spite of the jettison of most of the structures of a conventional Superman story. Instead, Snyder brings his penchant for remixing pop culture iconography as he transforms the Superman canon into a fantasy melodrama. Despite the talented ensemble cast, Hans Zimmer is hands down the MVP of the film. His bold score and super heroic themes pulsate the film's narrative forward to with an incredible sense of energy, paralleling the stunning visuals, making the film what it is. Man of Steel is a fairly straightforward, small, and condensed story told in a large, lavish, boldly ambitious way and Zimmer's music underscores this very well. Man of Steel boasts such an impressive cast yet side players Laurence Fishburne (Perry White), Diane Lane (Ma Kent), Christopher Meloni, and others are short shifted. There's a lack of character development outside of Superman and his core relationships. Towards the end of the film, we follow supporting characters escaping death and destruction without any weight or stakes in their survival. Snyder focuses so heavily on imagery, design, and style at the expense of the supporting performances. 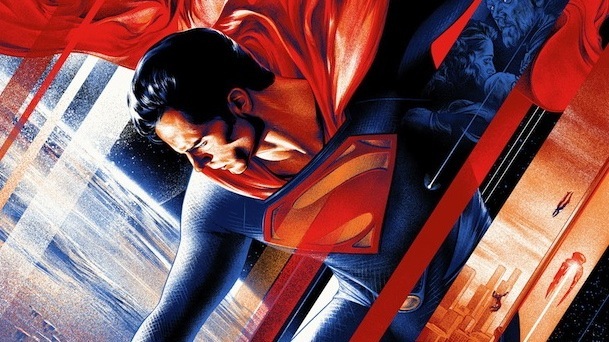 Snyder and company have done the near impossible in rebuilding and reimagining the Superman mythos on film for the twenty-first century in a fairly grounded, crowd-pleasing fashion. This is very much a post-9/11 Superman with all the problems of today, mirroring our troubled world. What Man of Steel does best is build this world on screen with an alien superhero searching for his humanity at the centre of it all. By the film's end, we feel that anything can happen and Superman is in store for many thrilling adventures to come. hour deciding if to walk out.